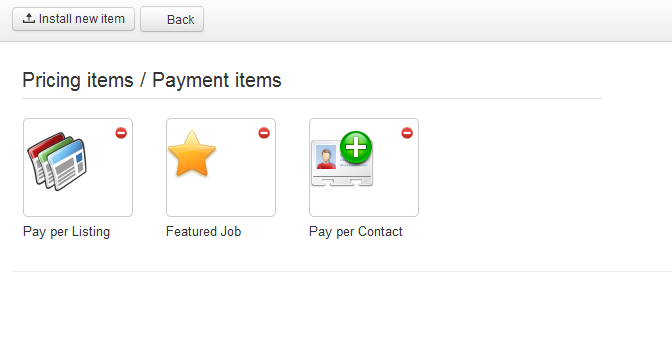 Jobs Factory comes with multiple out of the box Payment Gateways which can be used to pay the Payment Items. Requires you to add a Login ID and Transaction Key. These are used by the payment gateway to authenticate that you are authorized to submit Web site transactions. Transactions that cannot be authenticated by the payment gateway using these values are rejected. You can enable the Sandbox as a testing area during the development of your store. With sandbox enabled, no payments will be processed. You can enable PayPal Sandbox as a testing area during the development of your store. With sandbox enabled no payments will be taken. Along this, you will need to add your PayPal Email address and to choose if you wish to autoaccept the valid payments. Requires you to set the Email address which will be used by the gateway. For this, you will need to add your 2Checkout email address on the X Login field. Below you can enable the Test mode of the gateway. Using this setting, all sales will be treated as testing, regardless of any parameter value. It is also important to know that 2Checkout does not support multiple currencies. You have to use the 2Checkout account currency as your default. Provides a WYSIWYG text editor where you can add Bank Wire information. Requires you to add the Terminal ID, a 12-digit unique number that is assigned to your merchant number when you apply for a SagePayments account. Add the merchant banner image to be displayed. You can upload your banner via the virtual terminal. Optionally, you can customize the payment page by changing the color of various items. Requires you to add an API key, in order to use this gateway. Mollie is usable only in EUR payments. The PayTrail Gateway only accepts EUR, and the Minimum payment amount accepted by the service is 0.65€. Test credentials are filled by default, replace before going live! Other Gateways can be added into the extension, refer to our API for 3rd party Payment Gateways integration. To enable or disable the items click on the symbols in the upper right of each item. A pop-up should appear with "Click to disable" or "Click to enable" when hovering over the icon. Pay per Listings item will allow you to request a defined price for every new posted job offer. In case the respective company does not have the required amount in its balance, the offer will be set as Unpublished and a payment of that value will be added on pending, with the user being redirected to a payment form for buying the required credit for the offer in question. When the company is charged and the payment is completed, the offer will become Published and accessible by other users. The configuration part of this feature will let you set the default price for listings. You can add different prices for each user rank and also for specific categories of jobs by checking Enable categories pricing checkbox and by adding the prices next to their names. Leaving the fields empty means that the categories will have the default price. (!) The used currency will be, as default, the one set on the Settings/Currency Manager page. However, in case the payment item is disabled, it will not update to a new default currency, so be sure the payment items which you wish to use are enabled before switching to another currency. When promoting a job offer to Featured, the amount of credit needed will be "consumed". Else the company will be redirected to a payment form for buying the required credit for the offer in question. When the user part of the payment is done, PayPal will send an IPN notification to the site with the payment information and status. The IPN will arrive if the payment is valid, directly accepted if the company PayPal account is trusted or manually accepted. In the latter case, the payment must be approved by the webmaster and only after this, the credit will be available on the company's account. The Featured Job item adds offers on top of the lists and with different, more visible templating, regardless of sorting. Amongst featured job offers, the regular sorting applies. (!) The used currency will be, by default, the one set on the Settings/Currency Manager page. However, in case the payment item is disabled it will not update to a new default currency, so be sure the payment items which you wish to use are enabled before switching to another currency. For this feature, you can set a default listing price that users will have to pay when they promote their job offer to the featured list and also set different prices depending on user's ranks. With Pay per Contact you can hide users details from each other, making them pay a defined price to reveal those details. Contact buying is the same as for every credit buying. In case you don't have the required amount of funds in balance, you will be redirected to the buying form where you choose to buy credits to view hidden profile info. Contact info is bought when the user is charged and the payment is completed, as for every payment pricing. This feature is not available in CB because Community Builder displays, by itself, the profile of a user, and only setting up restrictions of privacy directly in CB can prevent hiding the user details in case of an active CB. From the backend, you can set the price that users will have to pay to view hidden profile info of other users. (!) The used currency will be, as default, the one set on the Settings/Currency Manager page. However, in case the payment item is disabled it will not update to a new default currency, so make sure the payment items which you wish to use are enabled before switching to another currency. Preferential prices for Verified Users and Powersellers can also be set here. The Currencies area allows you to manage all the currencies that you wish to be used on your website. You can select a default currency so that, when payments are made with other currencies, it will convert them automatically by using the conversion rate. Clicking on Refresh conversion will update the rates using Google conversion. Clicking on New will allow you to add new currencies. Simply add the currency abbreviation and a conversion rate. In case you don't know the conversion rate you can leave the field empty and click on Refresh conversion later on to update it. The CRON script also updates currency exchange rates according to Google. Check the CRON documentation for more. (!) You need to use internationally accepted 3 character currency codes; e.g. USD, EUR. 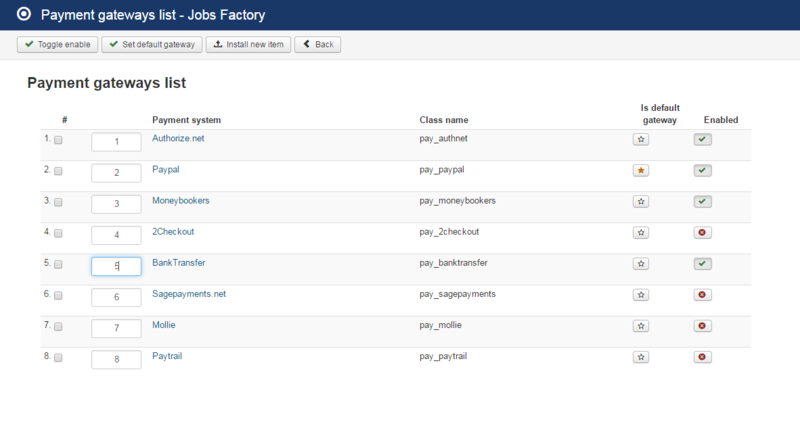 Payments on Jobs Factory are related to the 3 available items of the component. By enabling any one of them, you will need to manage the payments. By accessing Payments tab you will find 3 sections which allow you to view and manage user's financials by confirming orders, payments or adding funds. On the Orders section you can see orders placed by the users with all the details, such as the date when the order was made, the total owed and the status. When a payment is processed by the gateway, it will be displayed on the Payments section. You can confirm the payment from here or add payments manually. Clicking on the Add funds button found at the top of the Balances page will let you add a manual payment for a certain user. In case you need to decrease the funds of a user, simply add a negative number in the Amount field.